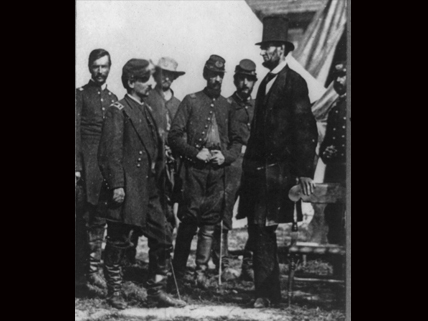 President Abraham Lincoln meets with Union generals after the Battle of Antietam in mid-September 1862; soon after, he drafted the Emancipation Proclamation. The events that are often collectively called America’s Second Founding have entered their sesquicentennial (150th anniversary) commemoration phase. It has been a century and a half since the passage of the first of the post–Civil War constitutional amendments—the Thirteenth, Fourteenth, and Fifteenth, often called the Reconstruction Amendments. These amendments were intended to bring freedom and equality to African Americans, especially the nearly 4 million freed slaves. Even as the nation continues to struggle with issues of racism and justice related to its African American population, a valuable perspective can be gained by looking back to this historic achievement. Passage of a constitutional amendment to abolish slavery was Abraham Lincoln’s crowning political accomplishment. In accepting the Republican nomination for president in the summer of 1864, Lincoln called such an amendment “a fitting, and necessary conclusion” to the Civil War, which had raged for more than three years, and was still many months from ending. After being reelected, he pushed the Thirteenth Amendment through Congress, staking his legacy upon it. Though he would not live to see its full ratification by three-fourths of the states, the amendment—paired with the Emancipation Proclamation—can be seen as Lincoln’s central contribution the “new birth of freedom” his Gettysburg Address had promised. This particular episode of Lincoln’s career was the focus of the award-winning film Lincoln in 2012. The amendment came up for a final vote on January 31, 1865, and the overwhelmingly support of congressional Republicans, members of Lincoln’s political party, saw it through. With Lincoln’s signature appended (an unusual and unnecessary addition), the amendment then went to the states for ratification. It took most of a year before Georgia’s approval, as the 27th state, made the amendment an official part of the Constitution on December 6, 1865. The Thirteenth Amendment effectively ended legal slavery throughout the Union, but it contained an exception clause, which was then exploited by white supremacists in the South to continue slavery of a different kind among convicted criminals, most of whom were African Americans. Because the amendment allowed for slavery “as a punishment for crime,” the criminal justice system allowed this form of involuntary servitude to continue. As we celebrate the Second Founding, many Americans are calling for an amendment to the amendment. This Library of Congress Web page documents the history of the Thirteenth Amendment—from debates in both House and Senate, through President Lincoln’s presidential papers, to ratification. It is a digital clearinghouse that includes contemporary newspaper coverage; numerous pamphlets about slavery, African colonization, Emancipation, Reconstruction, and related topics; primary sources; and a guide for history teachers. This article reviews the fight led by President Abraham Lincoln to gain congressional passage of the amendment to abolish slavery. This article discusses the background of the Thirteenth Amendment, its passage and ratification, and its significance. This article argues that racial injustice in the United States shows that America’s “Second Founding” is still unfinished; includes a link to a “symposium” on the topic. This opinion piece by the president of Prison Fellowship, discusses the current consequences of the exception clause in the Thirteenth Amendment that allows involuntary servitude of those convicted of crimes.